“Germans are now predominantly of the opinion that they would be better off if Greece left the euro zone,” said Carsten Hefeker, a professor of economics and an expert on the euro at the University of Siegen….With the so-called troika of lenders — the European Union, the European Central Bank and the International Monetary Fund — demanding budget savings of $15 billion by the end of June, the issue seems likely to come to a head soon. 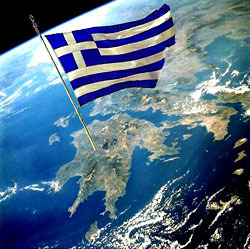 Perhaps the one card Greece has to play is the danger its exit could pose to other, much larger members like Spain and Italy, with far greater consequences….In what some consider the most likely possibility, the creditors would agree to renegotiate the terms of the bailout and the new Greek government would go along. But there is also the possibility that the troika will finally refuse to hand over any money whatsoever, something the I.M.F. did a decade ago in Argentina, when Buenos Aires failed to meet its bailout terms. If this happens, many experts say, Europe will be ready. “Preparations are quietly being made for the contingency if Greece decides that it’s better off with its own currency,” said Heribert Dieter, an expert on international financial markets at the German Institute for International and Security Affairs. Bottom line: The German public is tired of Greece. The rest of Europe increasingly thinks of them as a special case and doesn’t think Greek exit from the euro would produce insurmountable contagion to Spain and Italy. In addition, since the troika already owns most Greek debt, default wouldn’t have much impact on EU banks. In other words, quietly but steadily the rest of Europe has been preparing itself for Greek default and exit from the eurozone. The only real reason to avoid it is that it wouldn’t solve any of Europe’s structural problems anyway, but German leaders don’t seem to be buying that argument at the moment. A eurozone crackup is hardly inevitable, but it’s becoming an ever more tolerable possibility with every passing day.